Whoa - I've been a busy bee this week so I don't have a lot of art to share today. I only have an iPhone pic of the final mani that I had to snag from my Instagram. I started with a base of OPI I Don't Give A Rotterdam, a shimmery grey that is more complex upon closer inspection. 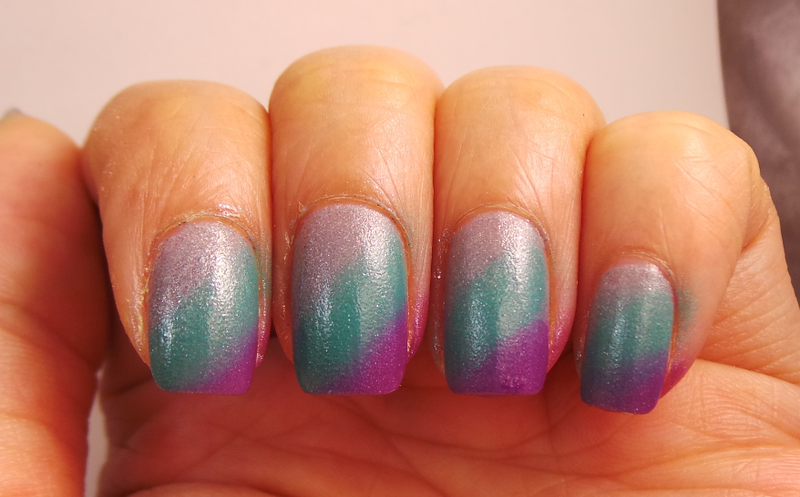 Then I created a diagonal gradient with Essie Naughty Nautical (aqua) and Nyx Purple. I added the faux watermarble type image from Vivid Lacquer plate 009 and Konad White. I have never been able to make watermarbling work for me, so this is an easy cheat. Any tips of making real water marbles work? Sneak Peek, Coming this Fall!